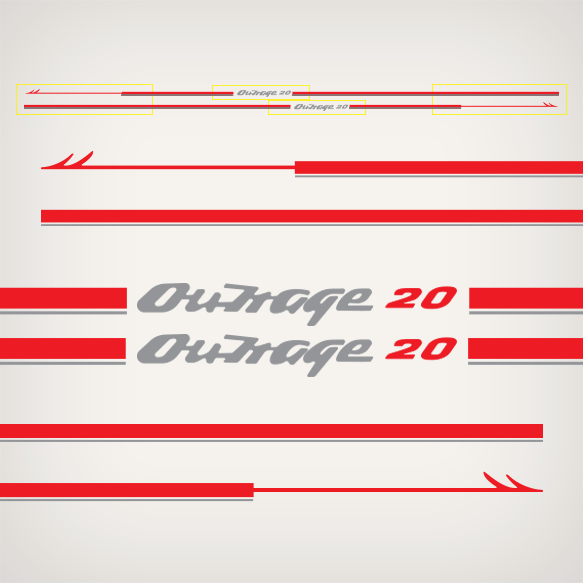 Outrage 20 Harpoon Stripes as seen on Boston Whaler Boats. Overall size: 13.16’ feet (158 inches) long aprox. Overall size is 13.16’ feet (158 inches) long aprox. Boston Whaler Outrage 20 boat decals as appears on the image. Overall decal as seen on the upper part of the image. The lower part of the image, is a close up of 3 sections of the decals, showing the harpoon decal pointing opposite sides.